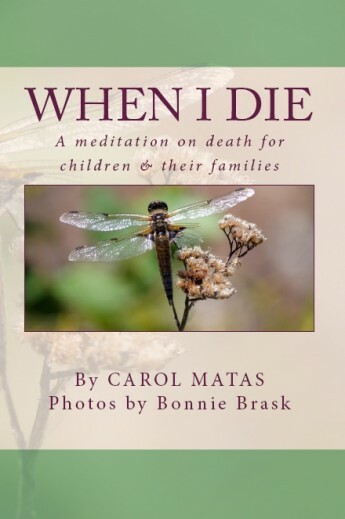 Sept. 30, 2013 - PRLog -- Carol Matas, author of more than 40 novels for young people, has just published a short but powerful meditation on death entitled When I Die. The text is complemented by stunning photographs by Bonnie Brask, Matas’s daughter-in-law. Matas hopes that this book will give parents a safe place to start a discussion with their children about what it means to die, and bring comfort to children and their families dealing with bereavement. Carol Matas is an internationally acclaimed author of 43 books for children and young adults, ranging from Holocaust and historical fiction, to contemporary, fantasy and science fiction. Eleven of her best-selling novels, including Daniel’s Story, deal specifically with the Holocaust; they are read in schools as a way of teaching children about this dark period of recent history. Daniel’s Story was commissioned by the United States Holocaust Memorial Museum in Washington, D.C., to accompany the museum’s children’s exhibit. Carol’s many awards include the Sydney Taylor Book Award (Sworn Enemies), the New York Public Library Book for the Teen Age (Sworn Enemies, The Burning Time, After the War, The Garden, In My Enemy’s House and The War Within) and New York Times Book Review Notable Book (Lisa’s War). Dealing with serious and thought-provoking issues, her novels have been published all over the world in more than a dozen languages and are loved by readers of all ages. Middle Grades Novel Inspired by a Quebec Eastern Townships "Store Dog"